As many of you will already know, Master Builders KwaZulu-Natal has a copy print retail division, on the ground floor of our building at 40 Essex Terrace. We have wide format capability and can print large sizes to vinyl. We also do customised wallpaper printing and are able to print to canvas. In order to promote our printing services, we took a stand at this year's House and Garden Show and I have to say, plenty of interest has been shown. People seem to love the idea of customised wallpaper and enlarging family photos to huge sizes. The stand itself is made up of twelve panels; six comprise the back wall while three on either side make up the sidewalls. Mounted to each panel is a 2.5 meter by 1 meter sample of customised wide format vinyl or wall paper print. 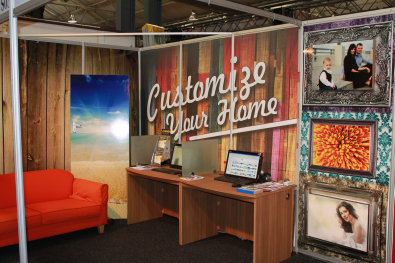 We wanted to draw attention to our stand so we therefore went with exceedingly bold and bright images. If you are going to the show this weekend, stop by and visit us. Other than those already mentioned there are a variety of other surfaces we are able to print to so whatever your print requirement, give Jhan a call on 031 266 7070.